By using extra virgin olive oil in the recipe instead of vegetable oil, this breakfast snack is transformed from sinful treat into a healthy start to your day. Preheat oven 325 degrees. Grease and flour three 8” x 4” loaf pans. In a large bowl beat the eggs, olive oil, sugar, and vanilla. Add the flour mixture and stir until just combined (do not over mix). Stir in the zucchini. Set aside. For the streusel, combine the brown sugar, flour and cinnamon in a bowl. Add in cubes of the cold butter. Using your fingertips, pinch together the mixture to form a loose crumb. Stir in the walnuts and chocolate chips. Spoon approximately 1 cup of batter into each loaf pan. Sprinkle each with 3/4 cup of the streusel mixture. Top with the remaining batter and then with a final layer of streusel on top. Bake for 45 minutes, or until a toothpick inserted in the center comes out clean. 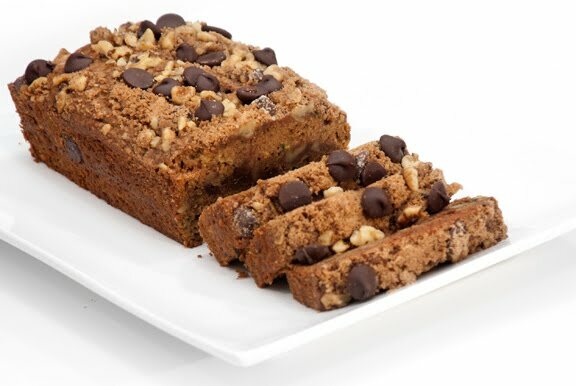 This was by far the best zucchini bread I have ever tasted ... thanks for sharing it with us!